Recommendations focus on how much people should eat during the day to stay healthy. Ministers and public health experts have long been telling us we eat too much sugar, saturated fat and salt but less attention has been paid to the size of the portions on the plate. Now a new guide to portion sizes warning that people are eating too much without realising has been launched by nutritionists, to suggest how much food people should eat during the day to stay healthy and help combat the obesity crisis. 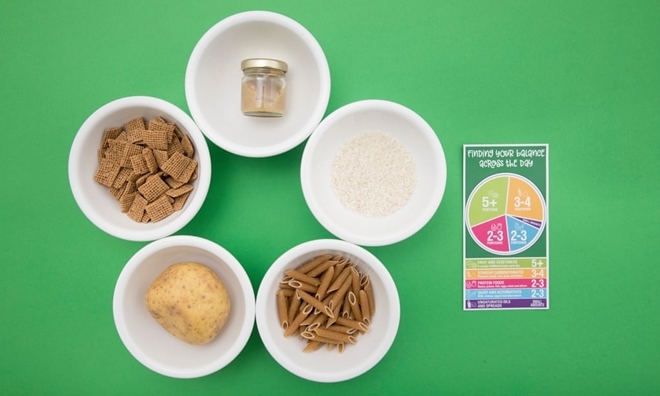 The British Nutrition Foundation’s (BNF) guide is designed, it says, to complement the government advice on the sorts of foods to eat, as laid out in the Eatwell Guide. It spells out how much of each sort of food – starchy carbohydrates, protein, dairy, fruit and vegetables and oils and spreads – constitute a healthy diet within the 2,000 calories a day that women need and 2,500 for men. Super-sizing is clearly out but portion sizes are a puzzle to many. While an apple or a banana is a portion in itself, the right amount of pasta or rice to cook in the interests of staying a healthy weight is more difficult to assess. 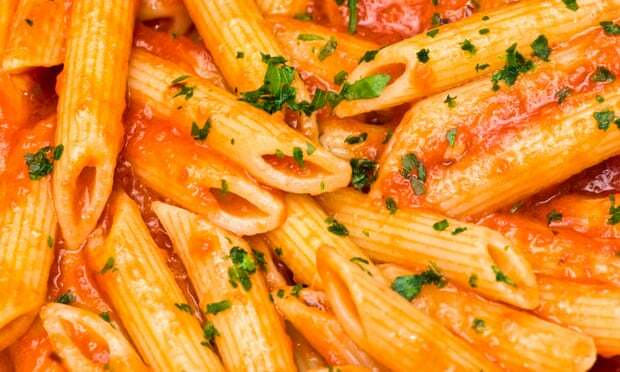 Recipes vary and many people take a guess and throw more into the saucepan if they feel particularly hungry. The BNF, in its new guide, says the answer is 65g to 75g dry weight (180g when cooked) – or about the amount that would fit in two cupped hands. The guide offers spoon and hand measurements, which may be easier in daily life than continually getting out the scales. The suggested single portion of a grilled chicken breast, a cooked salmon fillet or a cooked steak is “about half the size of your hand”. This acknowledges that bigger adults, with bigger hands, will need larger portions. Cheddar cheese should be no more than “about the size of two thumbs together” and a baked potato “about the size of your fist”. The government’s Eatwell Guide, says our diet should be made up of one-third fruit and vegetables, one-third starchy carbohydrates and the rest divided between dairy and protein. That means, says the BNF, we can eat five or more servings of fruit and vegetables, three to four of starchy carbohydrates such as potatoes, bread, rice and pasta (which in line with research this week should be wholegrain), and two to three portions each of protein foods and of dairy or alternatives and stay healthy without overdoing the calories. She says the BNF looked at the data from the national diet and nutrition survey and found lots of variations in the sizes of people’s portions. “Our suggested portion size for cooked pasta is 180g (254 calories) but, for example, when we looked at portion sizes for spaghetti, the most commonly consumed size was 230g (324 calories), and about 10% of the sample we looked at were consuming 350g as a portion, which would provide nearly 500 calories from the pasta alone, before sauces and sides were added to the meal,” she said. The guide says an easy way to measure spaghetti is to use your thumb and index finger to hold a bunch the size of a pound coin. It suggests smaller portion measures for snacks, such as 20g of unsalted nuts and seeds or the amount that fits into the palm of the hand, which will be between 113 and 137 calories. Also snack size is 55g of reduced-fat hummus – about two tablespoons, four cooked cocktail sausages or two falafel (40g and 113 calories). A portion of fruit or vegetables – of which we should eat at least five a day – could be two plums, two satsumas, seven strawberries, three heaped serving spoons of peas or carrots, one medium tomato or three sticks of celery. If you do include treats, says the guide, they should be small, at around 100 to 150 calories, and not too frequent. Their examples include a small chocolate biscuit bar, a small multipack bag of crisps, four small squares of chocolate (20g) or a mini muffin. The guidance was produced with help from a panel of experts, says the BNF, and funding from major food companies and supermarkets including Waitrose, Tesco and Marks and Spencer.